Dropzone Commander Review: Is It Expensive? This is the first step in a series of articles about DzC (as Dropzone Commander is apparently known to its friends). I will be looking at the book, the models and the game play of the beast in due course. However, before we delve into all that, I’d like to talk about something I’ve heard a lot in conversation about the game: “it’s pretty, but it’s expensive”. This seems to be a general reason for people not trying the game. I thought it bore a bit closer examination. Firstly, I’ll agree that it’s pretty. We can come back to that later though. What I’m really interested in here is the notion that it’s expensive. To start with, expensive is a comparator – you can’t be expensive in isolation. So what is it supposed to be expensive in relation to? I thought I’d make a few assumptions and then do some back of an envelope calculations to see whether that criticism holds up. How Long is That String? You and I both know that most figure games don’t have an end to the armies you can collect. The company responsible will keep adding cool stuff and you can always find room for another unit in your force. So where do we stop? If we’re going to say something is expensive or cheap, modestly priced or extortionate we need some idea of what we are measuring. We need some ground rules so we can compare DzC to anything else. My suggestion is that we compare the ante: what does it cost to “buy into” this game? How much do I need to spend before I can sit at the table with an army and any rulebooks, army lists and suchlike I will need? That sort of minimal game is seldom if ever the “real” game, but it’s enough to get the hang of the core mechanics and try the thing out. Note that I’m talking about the full game rather than any cut down “try this out” version that may be available. I think that in order to really get to grips with a game you need the full rules and the full army lists (and card decks, special dice, etc for your faction – but not normal dice or tape measures as I’ll assume you probably have those anyway). You can always buy another model, but this is about the basics. The ante, for me, is all the paper products required plus enough models to make a start. I’ll be using the RRPs in pounds to make these comparisons. Currency fluctuations, varying discounts and so on make this a less than exact science, though in general the relationships between games should hold true. Don’t worry about the details too much. I’ll also assume that you’re going to buy all of this at once so you can take advantage of whatever starter sets, etc are on offer. Oh, and while I’m discussing ground rules, I should say that Hawk Wargames (who make DzC) kindly supplied the review copy (thanks Hawk!). I don’t think that’s going to make a jot of difference to the review, I just thought I’d say in case you were wondering. This is the easiest of all the calculations here. It’s £83. Hawk sell 3 levels of starter set for each of the 4 factions. What you need to get going is the rulebook (£15) plus any one of the smallest starter sets (£68). That gives you the full rules, all four army lists plus the faction specific card deck and just over 500 points of models. This will be a very small game, to be sure, but it’s a game. 500 points is the smallest game they define in their sizes of battle. It’s worth mentioning that they also have a set of free pdfs of buildings for you to print out and make into a city to fight over. Always helps to have a battlefield. So, £83 to get you going with DzC. 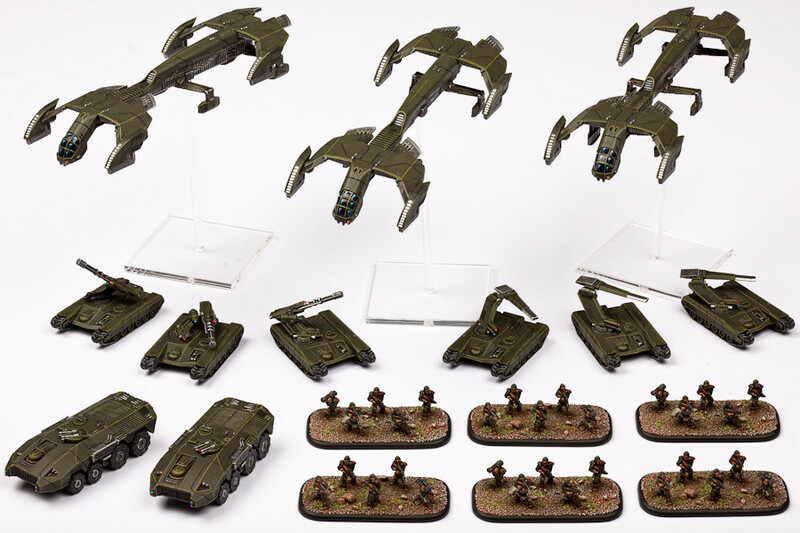 Dropzone Commander is a 10mm scale battle game where the eponymous dropships cart your battlegroups about a tabletop, depositing them where they can rush in to seize objectives and suchlike. Well, that’s what I read. I’ve not played it yet. Either way, it’s obviously not a 32mm skirmish game with half a dozen models a side, so comparing it to them is nonsense. DreadBall is just £49.99, so does that make DzC expensive? Again, I’d say that it’s not a reasonable comparison. DB is a board game, not a tabletop battle game. I think we should compare Dropzone to 40K and Epic from GW as they’re both well known SF battle games – one in a larger scale and one smaller. Spartan have recently put out Planetfall as their 10mm bit of Firestorm Invasion and it would make a very good comparator. That’s a 10mm SF mass battle game too. Let’s start with that. This is fairly new, so there isn’t a lot out for it yet. However, they do sell starter sets that include a small force which is described in the rules as being tailored for their smallest size battles, very much as the DzC ones are. These include a bunch of models, a set of rules and the cards you need for the force. They cost £45. It is worth noting that according to the Studio Sparta site, Planetfall is currently being sold at “very special introductory prices”, and so presumably £45 is not their “real” price. Still, it’s a lot less than DzC. As we’ve been talking about physical rule books so far, it seems only fair to keep that going with Epic. The rules then, are £35 on their own. They are available as a free pdf though (as is Planetfall), but that’s not an even comparison. You’ll need some order dice at £7.20. The Space Marine models to play one of the sides in the combined arms training mission (a very small game) would set you back £55.10 (with some models left over to build some more basic infantry units). This comes to a total of £62.30 with only digital rules, or £97.30 with the softback book (which I think is a fairer comparison). Exactly how big a battle you’re getting to play and whether it’s (a) representative of the game and (b) a fair comparison is hard to judge, though it’s probably enough to give you a flavour and will do for our purposes here. It is also true that the equivalent size (in points) of mass armies such as Imperial Guard or Orks will cost a lot more cash than this. Space Marines generally have nice, compact forces. On the other hand, DzC forces all cost the same to ante up on. Well it’s a bigger scale and that makes a difference in some ways. However, for the basic principle of getting enough to make a start at a mass battle game I think the nominal scale of the figures is less of an issue than it might at first seem. The obvious starting place for 40K is the Dark Vengeance boxed set. This comes with a mini rule book and two small armies for £61.50. Are they enough for a scrap? I think it’s enough to get a general idea of the game. Unfortunately, that’s not all you need though. To match the other games I’ve talked about you’ll need the codex for your army which will be either £25 or £30 depending on which side you pick. This makes it £86.50 or £91.50 depending. That said, you’re getting both sides here, not just one, which makes the comparison fuzzier. Obviously you could choose all sorts of other things to compare DzC to. In historical games, DBA and a 15mm army (the most popular scale) would cost a lot less, but a Warhammer Ancients or Hail Caesar army and rules would probably be more expensive. Partly that’s because they are usually 28mm scale games, but it’s also that they field big regiments. Anything modern enough to have vehicles starts getting expensive for that reason. Flames of War, for example, has a £35 rulebook. You can get an infantry company for the same sort of price, but if you’re buying a combined arms army you could triple that. One thing I haven’t mentioned is the quality involved. A Lada and a Ferrari are both cars. Ferraris seem very expensive when compared to Ladas if you ignore everything except the actual price tag. Here we enter the muddy realm of personal preference. What I think we can perhaps agree on is that the whole presentation of DzC (and all of the Hawk Wargames stuff) says that they want to position themselves at the high quality end of the market. You don’t go to them to buy a mixed bag of discount toy soldiers. They are claiming quality and naturally have a price tag to match. Their price tag seems to me to be about on par with GW, which seems to me to make sense when you look at the quality and detail of their offerings. They are more costly than Planetfall, and even if that bounces up in cost when the offer disappears I suspect they will remain cheaper than DzC. However, I think they look like they should be. Their whole presentation is not on a par, and whilst I’m sure it will be popular it is not trying to aim for quite the same niche. What I seem to be talking myself round to is that Hawk seem to have looked at the market and decided that they can sit next to GW on quality and therefore charge the same sort of price. Having said that, I think that GW is actually more expensive than DzC will be in the medium and long term. This is especially true of 40K which has a very heavily discounted starter set. The prices you’ll be paying to build up those starter armies will not change much with Dropzone, but will jump up sharply with 40K. So do I think that Dropzone Commander is expensive for what you get? No, not really. It’s a lump of money to drop in one go, but not especially out of the ordinary for starting a new game. This entry was posted in Random Thoughts, Review. Bookmark the permalink. 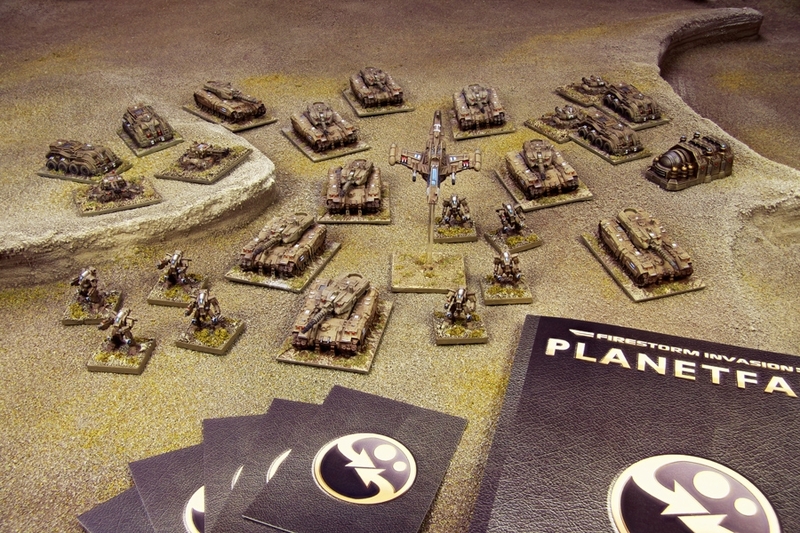 52 Responses to Dropzone Commander Review: Is It Expensive? Really thank you for this posting! Frankly I am always a bit tired when people use price tags for their discussions. After all, we are talking hobby material here, so on an objective level it’s just a pile of paper, metal, plastic, restic, resin and so on. It is /us/ that makes them valuable as tokens of our hobby – and thus it is always we ourselves who have to decide if some model or game it is worth buying. That said I cannot help but think that most hobby people do have some money to spend and are willing to spend it. There are very few really “cheap” tabletop games out there and as you said there is always room for more in our collections – and that also means more money at our disposal which we are willing to spend on our (and on this particular) hobby. Of course we all often say: this miniature’s too expensive or that rulebook is too expensive – but I do think that should be more: it is too expensive for the value I personally think I can get for my money. Personally I won’t get into this game, but that’s not because of the price tag, more because I’m already into too many games which interest me more – but that’s just a matter of personal preference, not one of the price tag. The DZC is too expensive moan is only marginally less annoying than the GW are too expensive moans. Even if DZC is expensive, and as you say that’s all relative, the moan rests on two fallacies.The first is that any game has a “fair price” and to be above that is profiteering.The second is that Hawk are forcing us to buy their game at an inflated price and fleecing us of our money. Until and unless Hawk release their accounts none of us can know whether the price accurately reflects the cost. More to the point, no-one is forcing anyone to buy DZC. The proof of whether DZC is too expensive will be reflected in sales. If it turns a profit and gains a player base then it is clearly not too expensive. Right now DZC is out of my price range. I’m studying full-time and only working a few hours a week so my gaming budget can only go so far. Once I’m earning a decent wage again then I’ll certainly be picking it up, price tag and all. It’s the same with GW. Even if I agree that their prices seem very high for what you get (4 static human size models in the White Council for £45! ), nobody forces you to buy them. The White Council certainly seems to be getting a lot of attention though I don’t think they’re all that overpriced in comparison to comparable GW minis. If they were sold individually for £11.25 I don’t think people would see it as a big price hike. I was in my local GW earlier today as I was considering getting a Genestealer Brood Lord as a proxy for the oop Genestealer Patriarch. Though it’s bigger than any of the White Council models it’s not that much bigger and it costs £15.50. I didn’t buy as I felt it wasn’t worth it though an actual Genestealer Patriarch plus Magus appeared on ebay this week for £50 and had I the money I’d have bought it. If nothing all these comments prove that “too expensive” is both subjective and relative. I’ll just say that I remember buying Citadel figures for 15p each. The price complaints aren’t necessarily solely about profiteering. It’s very possible that Hawk simply cannot produce what they want to produce, at the quality they want to produce it, at a price point that gamers are willing to pay. I think DzC is in the running price-wise with most other contenders. Skirmish-scale games like Malifaux are obviously far easier on the pocketbook, but for a larger, army-based game DzC is in the middle of the pack. Many of the complaints are. Direct comparisons are usually made with games like Firestorm Armada and DZC is then declared to be overpriced. Anyone who accepts that Hawk’s costs necessitate the price point wouldn’t complain the game is overpriced. They may say it is too expensive for them to pick up though this is less a complaint and more an obersvation. I don’t get the Ferrari-Lada comparison. Are you saying a Ferrari is not expensive? It is. It’s expensive as hell. Just because it may or may not be worth the price to some (personal preference, etc..) doesn’t mean it’s not expensive. I think what he’s saying here (and I don’t mean to put words in Jakes mouth) is that if you looked at nothing but the price tag on the cars it won’t give you the full story, not that the Ferrari isn’t expensive. Once you start looking deeper you’ll see the difference in quality between the two cars. A Lada at Ferrari prices would be stupid because of the lower engineering quality, performance and all the other things you associate with them. For the people that Ferrari’s are aimed at i.e the super rich they’re probably not too expensive relativley speaking. It’s certainly not more than the market can bear otherwise they’d have gone bankrupt years ago. Yes. But that is where things get highly “subjective”. Do the DreadBall vs. Dark Vengeance one. DreadBall gives you 21 minis (incl. Ref) for 50 quid. Dark Vengeance gives you 48 minis (incl. things like Bikes and the Helbrute) for 60 quid. So on a mini-per-mini measure, DreadBall is ~twice as expensive as 40K. On the other hand, if you compare it what “you’ll need to play” as done above, 40K will set you back a larger sum to get a “proper army” than DreadBall will set you back to get a “proper team” (or even two). So 40K is the more expensive game to play. Which one will you use to measure? I was very clearly using the cost to ante up for a game here, so in a comparison between DreadBall and Dark Vengeance DB would win. Most board games would win in that comparison. Comparisons are always subjective, which is why I defined my parameters before I started. Of course, you’re free to have different parameters. This is only one way to look at things, though I reckon it’s a very valid one. Model count is illusory IMO as it can have very little to do with actually playing a game. It’s nice to have more toys, but it’s not always necessary to play. DBA, for example, only needs an average of 36 models per army. By that logic, we’d all be playing flip-the-(cheapest)-coin. It is not. In the broader sphere of things (video games, going to the movies, playing golf), people are in this niche of the hobby because they have an affinity for miniatures. DreadBall is differentiated by .. say .. Football Manager 2013 in no small part because it is played with miniatures. And if those miniatures are twice the prize of (allegedly too) expensive Games Workshop, that is a factor to consider. Not the only factor. But not illusory either. Let’s say I have two games to pick between, both the same price and one with a higher model count than the other. However, the one with fewer models is playable as it stands and the one with more is not. In that case, unless all you want is a big stack of toys to paint then I’d say that the benefit of that model count is illusory: it looks like a benefit, but I can’t actually do anything with it. Yes. You can paint them. Why would you even buy a game with “miniatures”, instead of abstract game pieces (Risk?) if you’re not the least bit interested in the hobby aspect. Miniature games like DreadBall or 40K draw their appeal from a combination of different factors. Measuring any game by just one of the above misses the point of having a game that consciously and purposefully appeals to all the above (if with different weightings for different people). Model count is definitely a factor, not only between games, but within a game. For example, even though I had a cool concept for modelling and painting, I recently traded away my 40K Orks for Space Marines because I decided it wasn’t really practical for me to try to paint a horde army. Someone might buy SM instead of Orks because of the cost as well; If you wanted an army with maxed out basic troop options, six boxes of Tactical Marines is a lot cheaper than nine boxes of Boyz. That’s definitely not to say model count should be the only thing worth considering before buying in. I guess that it is “seemingly expensive” unless you actually do the maths on buying an army and the rules to get started. I think most people (me included) look at the number and size of the models I’m getting for that money though. It may be an illogical thing to do (comparing quality, material etc.) but getting 100 plastic models vs 30 resin ones for the same money makes DzC appear more expensive to the casual observer. Having the cardboard buildings is a great help to getting started. I’ve not done the maths on the resin buildings but to me those do seem very pricey. Especially considering that if you want a terrain heavy (the recommended set-up) 4×4 table (the minimum size) or as advertised a 6×4 table for the metropolis pack, the resin building set is over £700 (http://www.hawkwargames.com/products/metropolis-pack). Sure you don’t need it and it is a luxury item but you can spend a lot less than that on great looking scenery for other tabletop games. So getting started (and expanding an army) might be comparable with other systems, but buying into the whole experience (i.e. investing in the “proper” scenery) at the moment is expensive. Lots of toys is always nice, but if I have 100 models and can’t play the game vs 30 models and I can then I don’t think that the 100 is necessarily the better option. YMMV. I agree that the resin scenery looks rather pricey. However, I think that counting the resin scenery as part of the ante is unreasonable. It isn’t necessary to get a feel for how the game works, and even if it is then the free pdf stuff does the same job and I’ve seen several photos of it built up and it looks pretty good. I’d have to get a proper look and experiment with their resin scenery before I can say whether I think it is worth the money. I’m struggling to believe that it is at present, though I’ve only seen a few photos. it depends on how fiddly it is to assemble too. If it’s a pain to put together as well then I might as well make my own. If it’s dead easy to build then that changes the value in my eyes. Jake you can’t go mentioning free PDF scenery if you’re not willing to accept that at the ante stage of your price comparison a game that gives you access to the rules actually does have a lower ‘ante’ point than a game that doesn’t. On the whole I agree with you and your assertions in your article but you can’t say look this is free for one thing and totally ignore in comparisons access to free resources like rules in another. My mention of the free pdf scenery isn’t part of the cost calculation and so I don’t see what’s wrong with it. If I was using this as a means to make DzC look better then I would have costed scenery in the other games to compare with this, which I did not. It was more by way of an aside in case people didn’t know they existed. They are, after all, a nice set of buildings, and could perhaps be printed out at other scales to be useful in all manner of games. A free pdf rulebook allows you to play for nothing as long as you’re happy to proxy all of your models. Absolutely. I’ve done it myself and it works fine. That wasn’t really what this article was about though. Here I was looking at what it cost to get the correct models and the appropriate books, cards, etc, as I defined at the start. Incidentally, of the examples above, Planetfall and Epic both have free pdf rulebooks available (in case anyone was wondering). DzC and 40K do not. One additional factor to consider here – how it fits in with the existing toys. First an aside, I was all for getting this, until I discovered it was 10mm. I may still pick up a copy of the rules, especially if there is a cheap electronic version or I get to read the print version first, if reviews say it is good, but for me there is no commonality with my existing model stocks. Which is my point. How many people get into genuinely new ranges of models? I don’t know. I though tend to stick with stuff that can be used with existing models and games and vice versa. So if this had been 6mm it would have fitted in well with my 6mm sci fi toys. Now I know there are a lot of 10mm Sci Fi games (being Z gauge I believe?). And a yahoo group http://games.groups.yahoo.com/group/10mm_SFWG/ 🙂 Stuff like CAV has been around for a while, but has never been that common. So do you consider that compatibility factor in the ante? Well I guess no by the definition above. I do wonder if I become more or less price concious at, say, 6mm with a new game, comparing to other models, or if I tolerate a higher price as I get multiple uses out of them? As to the comparisons above, the game strikes me as pricy because I compare to the 6mm games I play, but I know that isn’t a fair comparison as the models are smaller and in the case of epic, largely second hand so nowhere near the RRP (is the aftermarket also a factor in a games cost?). Maybe a better comparison would be to a generic sci fi game like future war command or a 10mm sci fi player could chip in with the costs of getting into it from a different manufacturer. There is a review of DZC on Meeples and Miniatures episode 97 I think it is, second half of the show. Not the latest one, the one before that. Not ground greaking but a decent solid set of rules was the conclusion as I recall. They also discuss the price and the scale thing as well. @Chris – compatibility with your existing stuff is an interesting point. However, I’ve ignored it in the above calculation because I can’t know what you all have (and this will vary widely anyway). I’ve also ignored lots of other things for the same reason. I don’t know what your aesthetic tastes are, whether you’re mainly a painter or a gamer, what size table you have to play on, whether you particularly love or detest a given scale, how good your eyesight is, etc , etc. There are a great many personal imponderables which make a great deal of difference – in fact I’d suggest that they collectively make more difference than the price. Not topics I can really deal with though, other than from my own personal viewpoint (which I’ll get to in more detail later). I’ve also ignored the Ebay and second hand options as I can’t tell what discount you may or may not be able to get. RRP is a fixed reference point and so allows me to make a fair comparison. I don’t expect most of you guys to actually pay the full RRP though as there are so many retailers who will offer discounts these days. @Dave – thanks for the reference. I look forward to seeing the review of standard-army sizes, as I think that’s a far more meaningful comparison for game playing. I agree with Jake entirely that the model count for price is, to me, less than the price you need to actually play a game. To maybe rephrase what he’s saying in my agreement, which is better: Game A has models that cost $1 each, or Game B has models that cost $2 each? Well, what if an army in Game A consists of 200 $1 models, or B has 30 $2 models? Even if you’re only intent is to paint them and set them on the shelf, it matters – assuming you’re doing the entire army. If you’re doing one-off pieces, then I’d suggest that the individual model price isn’t a major factor, as it’s only en masse that it becomes problematic. Individual model price makes a nice abstract comparison, but I think it’s important to remember that companies control, via the rules for their games, how many models you need just as surely as they control the cost of each model. Final note, Jake: if you do plan on doing a full army cost comparison review for DzC, you should check out FFoR – it includes a tool to estimate the cost of an army that will probably save you a fair bit of number crunching. Thanks Buhallin. I’d seen that FFoR existed but hadn’t actually tried it yet and didn’t realise it did costs too. That’s a nice (& clever) thing to include. User request, not my idea 🙂 It’s something that came up many years ago when I was supporting Armies of Immoren. I left out the collection cost calculation for this one, but the calculator for both cost of an army and the models you are missing from your current collection is a very handy thing. I do like the idea very much. DzC is an expensive game to get into… when compared to many of the skirmish games out there right now. You can say it’s not a fair comparison, and I might agree with you on a rational level, but where personal choice and consumerism is concerned I’m sorry but rationality goes out of the window pretty darn quickly if we’re all honest with ourselves. The question for me isn’t whether this or any other game is ‘expensive’ or not. That’s a personal choice only you can make when you look at your bank balance. The more pertinent question is whether the game is worth it or not. I’ve had an awful lot of requests from readers for me to review this game and the miniatures. I’d certainly love to do so, but the simple truth is for me right now I can’t justify the spend. I’ve had a flick through the rulebook and thought the game looked solid enough if unremarkable. I’ve also seen plenty of the miniatures in the flesh and I have to say I think they’re really nice looking and are a really good quality too. I don’t think on an individual purchase level as a cost / quality comparator to other miniatures ranges I’ve seen that it is massively unreasonable. They might be at the upper limits of my tolerance ranges, but that doesn’t mean I wouldn’t tolerate those prices if I had the money. I’ll get to whether I think it’s worth it or not in due course. You know me though – I want to play it quite a few times before I make that sort of comment. Good post! I’ve been thinking about this myself. I see the cost as model Vs time instead of cost Vs number of models. The paper terrain are cheap, looks great and are very effective in building the table the creator wish you to have. Other game systems often “forces” you to purchase terrain like wood and buildings if you want an enjoyable game. All in all I see the game as very much cheaper than 40k. Although there are many other games much cheaper. But I don’t see the point complaining about the new building’s cost as a lot of people do. Don’t buy them, then! In an very subjective (and most likely unfair) opinion, that is to me like complaining at GW that dices in gold are too expensive to use in 40k. Prices normally aren’t a big factor to me personally.. not that I have indispensable cash but there are avenues to take to re-coupe the investment or to bolster your forces. Making my own casts from purchased models is one way I do this. Especially on the smaller scales. I’m certain it’s unethical but it’s for my personal use and I have no problem looking myself in the mirror after I cast a resin copy. Once I’m done casting my army, I can sell the masters I originally purchased. In the end I can count on at least a 50% discount on what a force that size would have cost. In some cases, I can completely wash the initial investment. Unethical? Certainly. Illegal? Possibly. Would anyone ever bother prosecuting you? Highly unlikely. Even so, it’s not something I’d do myself. For me, quite apart from the ethical issue, I think that my time is worth quite a bit, and so factoring that into the equation (along with the cost of materials, etc) I don’t think I’d be saving anything. You can build formidable 3,000 point armies for little money, even with Hordes. A 3k Catachan list going light on the airborne can be built for 60.50 (3 boxes of infantry, 1 box of Thunderbolts), An Ork Infantry box runs 950 points at the cheapest (if you include only the components GW lists in the store. If memory serves the box also includes a couple of big guns, which you could even buy an oddboy upgrade for). I just calculated the cost for a sizable Titan Legion for a friend of mine and using Forgeworld exclusively for both titans and air support ended up with 89.00. The pricy thing about Epic are Vehicles (where interestingly enough FW offers more bang for buck whereever both GW and FW have the same model: £12.30 for 3 Hydrae at GW, £6.00 at FW). A decent way to start an Epic army is to just get an infantry box and often this allows an army at least closing in on 1,000 points. SM tend to be expensive because they get their transport vehicles as free upgrades and the only unit you really want to drop this for are devastators. A final thing to note: You do not need orders dice. They aren´t listed under materials needed in the rules (there´s not even an explanation on their optional use) and with 9 orders (including one for broken formations) they aren´t even all that practical. What you will need (if you have barrage weapons at least) are the templates. There are cutouts to print out in the Pdf, but of course the see through ones from GW do nicely. Now, I´m somewhat partial to E:A – I still think it´s the best GW ever did, with just the right balance between abstraction and immersion and I do think it has an underserved reputation for being expensive. Foul? I don’t think so. You’re judging from passion and not from the criteria I set at the start. I said I was after the ante that would let you to “get the hang of the core mechanics and try the thing out”. You need more than just infantry to get the feel of Epic. I’ve not played EA for ages, so the army list I used was the list you need for the first of the training scenarios in the rules themselves. This is a list that Jervis (the game designer) thought was a good one to give the new reader an idea of how combined arms worked at their most basic. It seems to me that this is about as fair a choice of army list as I could pick. You entirely neglect to mention that the minimal list I mention does not include aircraft, flak, super heavy vehicles or titans of any sort. Nor have I picked an obscure army such as the Tau. In case anyone is unaware, GW all but abandoned Epic along with their other Specialist GAmes, and though the fans continue to provide a sort of life support, a number of the armies were never well supported and some models are no longer available. The Tau were only ever available as Forge World models and are largely discontinued. If I wanted to pick an army to make Epic look pricey then I’d say Tau. The fact that GW don’t make a starter set and sell their models in numbers that are inconvenient for the units in the game is nothing to do with me and everything to do with their packaging and marketing strategies. This basically guarantees that you will end up with spare models, whatever you buy. The same goes for the lack of starter sets. As GW don’t make one you have to get the core materials yourself. Whose fault is that? Not mine. Is it fair to compare them? yes, I think so. I’ve said all along that this is not an exact science because we aren’t comparing exact likenesses. If there is an argument against my costing for Epic, I’d say that I should have included at least one Titan as that’s a signature thing. However, in light of the spare infantry you’d end up with I left that out. For the purposes of the article above I think that my use of the author’s own training army list is entirely reasonable and calling it a foul is bizarre. Nowhere do I call Epic expensive. It is, however, at the higher end of the cost spectrum (along with other GW games and DzC) if one measures them on RRP as above. However, the upside of GW’s abandoning the Specialist Games to rot is that many players have given up on them and consequently Ebay often has models and armies at reduced prices. Fewer opponents, but cheaper armies. If you wanted to get started with Epic for real, this is the way you’d go. As a final thought, EA is not my favourite version of Epic so I never use the order dice on the very rare occasions I play. However, the few times I watched Jervis play he was using them, hence my adding them to the pile. They are certainly something you could muddle by without before you decided whether you needed to buy any or not. a) “You need more than Infantry to get the feel of Epic”. I don´t really agree here. While superheavies and tank companies may provide some of the feel of Epic, Huge Infantry forces also have that “mass battle” look and given the potential of even basic unmotorized infantry to move up to 60cm a turn (not including possible advances after being engaged and winning). you still get the fast change in positioning, which you need to respond to that´s the E:A staple. There´s a bit of history to this. The scenario was first written as an aide to playtesters, who would have their old Epic armies around. And at the time the E40k boxed set was still available (including everything but the predators), with the pronounced plan at the time a release of E:A as a boxed set, which would have included all the models. GW changed their plan (Standalone rulebook, no box), but the scenario remained. 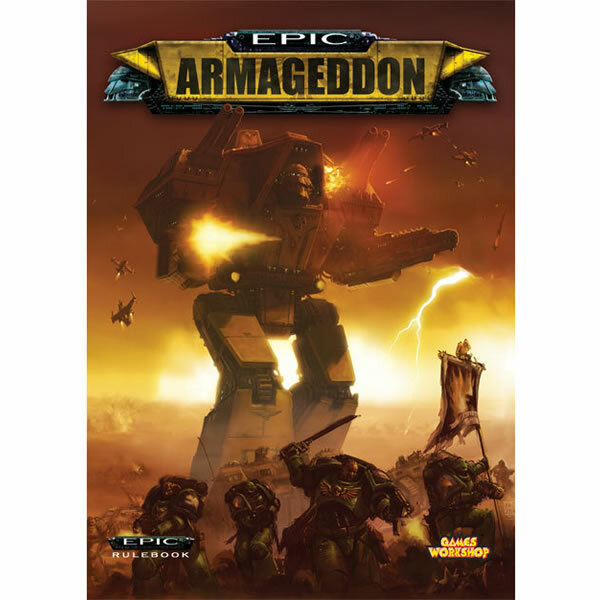 Unlike earlier incarnations of Epic and 40k Marines are not a decent beginners army for E:A – they are rather tricky to play with, because the more straightforward objectives are hard to pull of with SM. To pick up the rules IG and Orks are better suited. But that would not make the list more expensive. A Reaver from FW costs £18.00 In points it more than matches a unit of Predators and one of Whirlwinds (a pair of Warhounds from FW cost the same as the Reaver and come to just as many points as the tanks) . The lists I´ve mentioned are playable 3000 point lists. They generally have interceptors to deal with aircraft and pack enough punch to deal with war engines, as well as infantry of tak formations. The double standard there is that GW did not only choose to not release a starter, they also chose to provide the rules as a free download. As noted before there are no instructions on how to use them in E:A and there are far more orders than the orders die has faces. There are some nice print out counters on the web, there are various other ways to keep track of which detachments have taken their action and which haven´t. I wouldn´t even consider them useful for the game as it stands. Thanks for this post, Jake! I’m currently in the process of trying to persuade my boss to give me some cash to start stocking DzC in our store, where I’m in charge of the games dept. This helps. 🙂 Looking forward to reading more about this game. It looks awesome. Just a thought Stig (and this is purely anecdotal and may not be reflected by your customers) – you might want to order unequal numbers of boxes for the different factions. From what I’ve heard from other folk and read on the net, the PHC are the most popular and the Scourge the least popular. You could always ask Hawk too. Interesting, I’ll take that into consideration. Thanks! I suspect that unlike GW, Dropzone’s prices are quite possibly not giving the creator much profit. Remember it was pretty much a one man show for Dropzone, a lot of his own capital was invested. > Price. People over here play DW and when spending the same amount of money on both games they get far less minis in comparison. Having a hand-full of minis or a basket-full of minis led quite some to hide their purse again. The prices for the buildings are ridiculous. I do play FoW and buy a lot of scenery for it and for that money I would get much more buildings, to be honest I could recreate Stalingrad on a 180×120 table for that money. And that´s 15 mm vs 10mm. And for standard games you really need the middle or big deal to get some choices. >Game. In the beginning many thought that the dropships would play a big role in the game. But it turned out that they take way too long to move to use them for more than one or two drops. The game itself is nice, but does not really anything new to the game and army building is rather confusing for newbies. Still, I bought the rules, cause I like some ideas. > Quality. Though miscasts get replaced without problems too many minis in our neck had casting problems. Also, some of the casting-decisions are quite strange. Pipes are put into places where removing them will damage the mini in 90%+ of cases. Bu just placing them a bit to the side they would have not inhibbited the flow and removing them would be not such a pain. Also having them hollow on the inside makes bubbles sometimes a real problem. And last casting some units as left and right half creates seams that really are hard to get rid of. Simply making a lower and an upper part would have made it look much better. The game is nice, but not nice enough for any here to spend some money on. 1. Dropships are absolutely needed all the time. 3. (the current state). The player that use the dropships in the beginning correctly and then use them smartly for redeploying the last two turns win. It all started when we got experienced enough to understand that not using the dropships to redeploy meant that it was just a slug-out the last turns. Then someone started to embark a unit and deploy it against an more suitable target for as a turn five preparation before the final turn. If the opponent didn’t have a dropship to move away or had lost the ability to counter then the other player won. So everybody became much more careful of the dropships. So right now the dropships are kind of not needed during turn 3 and 4. Perhaps your experience would be like ours? A good analysis Erik. Given that the dropships are the game’s best USP I think it should revolve around them, and at present I’m not seeing enough use from them. But as you say, these things go in stages and I don’t think I’m at the end yet. Dropships do have a purpose in turn 3 and 4 as well and that is to keep the opponent’s AA guns occupied instead of having them fire at buidings. In the last turns it is very important to have a dropship or two left to be able to move units fast. Many times you only need to do an extra point of damage to protect your infantry inside buildings or damage the opponents units. That said, there are still plenty of times where you will not need a dropship after disembarkment, and they just feel like a throw away unit. Main battle tanks, for instance. But then you can use that dropship to harass the opponent and to protect your other droships by drawing fire in the right moments. Sounds like being a dropship pilot might be a dangerous job! 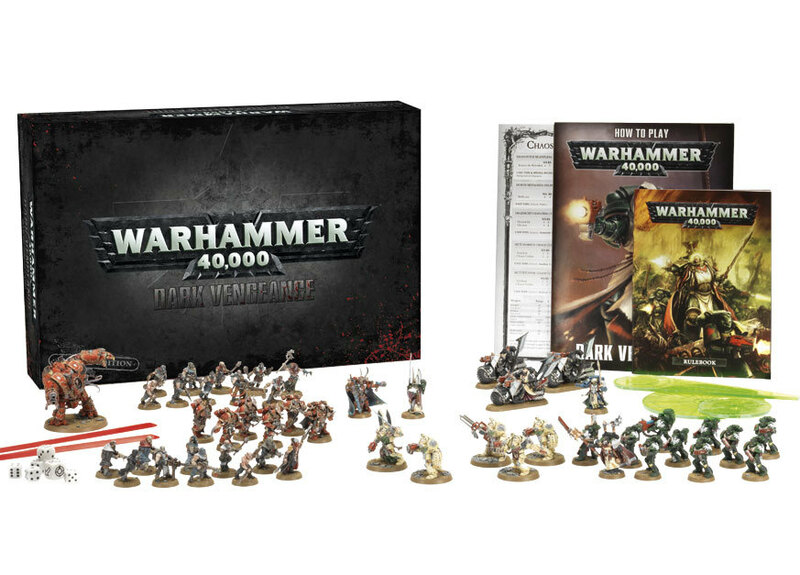 I’d imagine that with the release of the starter box, the buy in has decreased considerably (£53 not including postage) But no matter how I look at it, I still see the models as expensive. They certainly are not cheap. I can get a fistfull of metal from BF for the same as a fraction of that from Hawk, and I wouldn’t say BF’s FoW range was “cheap”, so that says a lot about DzC to me. Would it stop me buying it? No, I think I will shortly get the starter. Will I feel as though I am getting value for money as I do when I buy FoW, or Infinity? Nope. It simply is expensive. Not GW territory, but they might want to rethink their pricing at some point. Comparing the starter sets which are priced close to £80, to virtually all similar games, I just don’t see what I am paying for. Course… I only plan to stick to the starter set forces, and throw in a few toys for variety, so in this scenario it works out as “fairly cheap”. But I wouldn’t like it to be a game I was trying to get one of everything of. Now I just need to figure out wether or not I ought to add anything when I pick up the starter set or not.